2 Who are the anti-vaxxers, and why? 4 So if it doesn't matter, why force them? 8 Who are the anti-vaxxers, and why? One of the more interesting arguments, is who has control over your life (or your children’s lives): you or the state? I'm firmly in the camp of letting people make mistakes that hurt themselves as malevolent liberty is still better than benevolent tyranny. All choices around public safety tend to save some lives, and cost others. Some will assume because they save more lives than they cost, "hey net win" -- they're not thinking through the complexities of the Trolley Problem. If you make their choices for them, then you own the deaths. Whereas when you let them make their own choices, they own their own consequences. Thus while I'm not for avoiding responsibility of my own decisions, I am for not making life and death decisions for others. I see that as THE slippery slope to best be avoided. 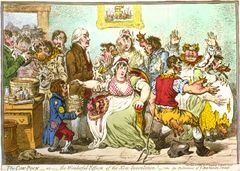 Vaccination debate goes back to the early 1800’s, and probably the mid 1500’s when inoculations first started in China. (This cartoon goes back to 1802). (c) at some later date, the claims are shown either true or false. (More often false: like the erroneous "MRR increases autism" scare). But most isn’t always false. With EVERY vaccination there is a risk. It is lower than the risk of the disease itself (and thus, I’ve always chosen to get them for myself): but even the safest vaccines have these 1:10,000 complications, and 1:1,000,000 deaths/cripplings/etc. So I don't agree with exaggerated toxicity and risks of vaccines, many of the minor amounts of nasty chemicals as stabilizers, etc, aren't dangerous in the levels given. And the studies that show otherwise are usually debunked later. So I'm not concerned myself. But who gets to decide those risks for you or your children, you or the state? Yes, you not taking that risk does endanger others. And yes, statistically, we can prove that it’s better for the collective to force these on to everyone, knowing a few will die because of it. But is that really your choice to make for them? I liken it to mandatory seatbelt laws. Most of the time wearing your seatbelt will lower your risk of death in a car accident. However, math and statistics say that in a few rare cases it increases the chances of death or injury. I was in a car crash (from right oblique angle) where the belt pinned my hip but left my upper body to twist more, and might have increased injury. I choose to take that risk and wear my seatbelt, because statistics tell me I’ll win more than I lose. But isn’t that my choice to make? Forcing seatbelt laws will save more lives than it kills, but it will kill some people. Isn't the state liable for those deaths if they outlaw the choice? With vaccines and herd immunity, your body may hurl from the wreckage and harm innocent bystanders, but again, you might be thrown free from a burning wreckage, and whose choice is it? So from what I’ve seen, I still don’t agree with the anti-vaxxers (not used derogatorily), and I have a few friends that are. I personally think the odds are still better to get kids and self vaccinated than not. But there are some rare complication rates and batches that are bad, and I'm not willing to force my view on "them", and tell them what choices they need to make with their or their kids lives, on the even more rare likelihood that there will be an outbreak of X, and that it will impact me or my family. 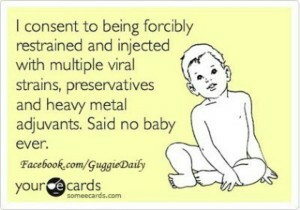 So I support vaccinations. But I also support other people’s right to decide for themselves and their kids, over the state making the decision for them. Who are the anti-vaxxers, and why? Anti-vaxxers are a large and diverse group (a few percent of 300M is still 9M people). And it's hard to generalize, because there's so many different reasons. The movement seems to have taken root a lot more among the left than the right (at least the celebrity anti-Vaxxers), like: Bill Maher, Jenny McCarthy, Alicia Silverstone, Mayim Bialik, Charlie Sheen, Jim Carrey, Kristin Cavallari, Holly Robinson Peete, Aidan Quinn, Robert F. Kennedy, Jr., Lisa Bonet, and so on. Lots of vocal anti-vaxxers on that side of the aisle, few on the other, but the Press has often played it off as a right wing anti-science phenom. But it's mostly a small percentage of society (≈1-3% of the population) that asks for personal exemptions for personal or religious reasons. A far bigger and more serious group is illegal immigrants (since immunizations are required for legal immigrants). 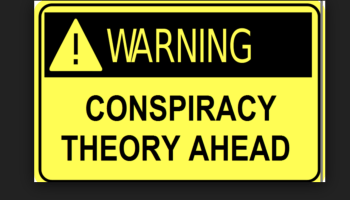 There's certainly a few followers of celebrity on the left, educated skeptics on the right, and a few conspiracy nuts on both sides, who are anti-vaxxers. I have a few friends that are anti-vaxxers, but they're mostly highly educated, quite reasonable, and thus their arguments are more intelligent and researched than those who oppose them. That might just be selection bias (I have a circle of smart and libertarian minded friends). But even so, the point is that their arguments for why they do or don't choose something is often quite well reasoned. And they've persuaded me, that there's enough grey-areas in this argument, that unless it's a case of a mass outbreak of a highly contagious and lethal disease (requiring the immediacy of survival), that we should leave this in the land of individual choice. The rest of this article goes into why. There's a lot of people who are sure of things that just aren't so. Like they think vaccines protected us from disease like the measles or scarlet fever. Only it wasn't. There's no doubt that the things that helped the most with most infection diseases was just advances in technology like clean water, waste disposal, hygine, nutrition, less crowding. 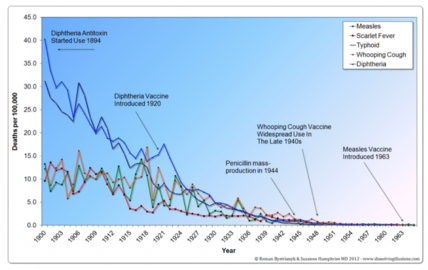 All the disease rates were dramatically on the decline long before vaccines, and some like Scarlet fever dropped to near zero, despite there being no vaccine. I'm not arguing that we shouldn't vaccinate, it's just that vaccines are a much smaller part of what protects us from serious illness than the anti-anti-vaxxers will tell you. If you eliminated vaccines, it's not like there's going to be sudden outbreaks that wipe out our civilization. 90% of the reasons we eliminated (or reduced) most diseases were not vaccines, thus the a few people not taking them doesn't suddenly reverse that trend (unless there's other things at play). So vaccines are good things. But they're credited with way, WAY more than they deserve. By the time we started mass indoctrinating and vaccinating, most of the risks had been seriously mitigated. And anyone that argues based on fear/ignorance that vaccines are what's saved society or is what's protecting their kids, should be educated (on the realities) or ignored (as too stupid to learn). But we shouldn't allow their lies/deceptions to propagate uncontested. You know what increases contagious diseases? Crowding unvaccinated illegal aliens in tight quarters, make them share bathrooms. Again the point is that if anti-anti-vaxxers were consistently pro-public health, they'd be anti-illegal-immigration, for public safety reasons. Bring this up to see how they respond, and if they really are concerned about public safety, or political agendas. (b) indirect protection (herd immunity). 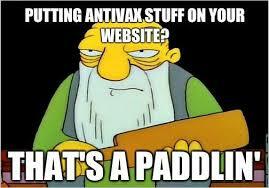 If your neighbor isn't immunized, it doesn't matter towards direct protection at all. Direct protection is whether you catch the disease because of your immunization, or if you do, if your immune system is boosted enough to beat the disease handily (before you're contagious or able to spread it). The only time your neighbors immunization matters (to you), is whether they provide herd immunity. And specifically, if they are the difference between crossing the threshold on herd immunity (the difference between causing or preventing an outbreak in your area). Diptheria, hepatitus B, polio and rubella all have vaccine effectiveness above (and herd immunity rates well below), current vaccination rates. Meaning we're past the thresholds needed. Thus a few percent of your neighbors not getting immunized holds zero risks to you, or your kids. (It's not going to cause an outbreak, and your vaccine would protect you if it did). Mumps, whooping cough and chicken pox all have vaccines whose effectiveness is LOWER than the level needed for herd immunity. Meaning more than 100% of people would have to get immunized to offer herd immunity. You're only protected by the direct benefit of the vaccine. Thus a few percent getting immunized or not, has zero risks to you or your family. All that is left is measles. And that one is both. There are areas of the country or State (California), where we're either well above/below (by 10-40%) what's required for herd immunity. Measles has a problem in that illegal alien communities, many haven't gotten immunized. So they're well below the rates necessary. But the anti-anti-vaxxers aren't usually complaining, attacking or trying to legislate against illegal aliens -- the direct problem. They vilify those getting personal or religious exemptions. But in none of those areas, is the 1-3% getting personal/religious exemptions able to make us cross the threshold for herd immunity. They're not the problem, nor will forcing them to violate their personal/religious beliefs going to make . So we're above herd immunity in most serious diseases. And the rates of immunization are going up very slightly (not down). So we're not even at risk of losing herd immunity. In most places, it's better than it looks because it's only a few communities that have risk of outbreak. (And that's very localized to illegal alien communities, dragging the average down). On top of that the actual immunization rate is likely higher than the reported rate. To qualify for full immunization we require things like two doses of MMR (an immunization cocktail). Why? Because early on, there were storage problems of the vaccine and some were getting a weaker dose -- so we double-pump the kids, just to "be safe". Since then, improved handling has eliminated the need that, but not changed the bureaucratic requirement. So if you only got one set of shots, you're fully protected medically, but not considered immunized bureaucratically. Just like if you only got measles or rubella immunizations individually, you might not be counted as immunized for any of them, because you're not bureaucratically immunized for all of them (the MMR checkbox isn't checked). Or if you actually caught one of the diseases, you have been immunized by virtue of having had the disease, but you're not counted as immunized, because you didn't get the state approved shot. So if you care, the trends (and threshold in your area) is something to keep an eye on. But unless you're in an area that's crossing a threshold, there's vitrually nothing to worry about at these levels. And I've never found an anti-anti-vaxxer ever show that they were in a community that was near or crossing that threshold. Or that they were informed enough to know. 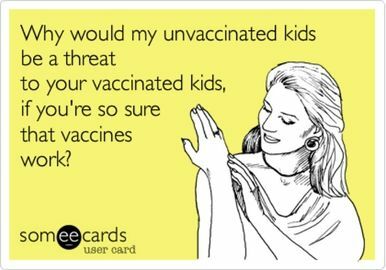 Thus all their complaints about their homeschooled neighbor getting vaccinated or not, is based on ignorance and control, not medical risks. So if it doesn't matter, why force them? To repeat the point, 99% of the potential diseases in the U.S., we're either way over, or way under, those thresholds for herd immunity. Thus whether we get compliance or not has no difference on public safety. Anyone with a clue on the topic, knows this. So why, do the bills mandating vaccines have all of these listed, plus a blank check for any more in the future, mandated? Are all the legislators stupid? Or are they counting on their constituency to be gullible? You'll never find anti-anti-vaxxer (progressive) that will answer those questions, because the answers aren't pretty. The answer is core to those trying to force others. Progressivism: ideas so good, they need to be implemented by force. and teaching the gullible to do what they are told without question (and attack others who do not follow hard enough). This is the bottled water, Alar, DDT, Bird Flu, Electromagnetic Fields, Mercury, Floride, Killer Bees, Bee Collapse Disorder and the Salt scares that came before it. The politicians will keep selling it, as long as the gullible keep buying it. And in most cases, it is the left that gobbles this stuff up in the name of the greater good. There's a huge difference between refusing to get a smallpox vaccine during an outbreak, and running people out of town because they didn't get their Flu shot (or they preferred to skip MMR, and get only mumps/rubella individually instead of in a cocktail). So there's a spectrum here, and that's a nuance that I've rarely seen the anti-anti-Vaxxers concede. Yet, these extremes are the first arguments they bring up, "so if you don't agree with me, you must think that we should never force vaccines". Basically, they're pretending someone refusing their flu shot is the same of rejecting getting smallpox. So I have to preemptively concede the point. If we're in a pandemic and/or a communities survival is at stake, then sure: conscription and forced vaccinations should be tolerated. But most of the things that cause pandemics are the things we're NOT vaccinating for, so the argument about survivability of the community is usually a strawman. And we're NOT talking about those extreme cases, we're often arguing about something far milder. Their unwillingness to accept that reality, shows who is more extreme. The biggest fight is over cocktail vaccinations of non-lethal diseases (like MMR). And if you're in one of the healthiest places in the world, and someone is home schooling their kids? I think the choice for getting their MMR shot should probably be theirs (not the states) -- even if I would give it to my kids. If you don't have liberty over what you stick in your body, then where the hell do civil rights begin? The same on the other side. I don't believe that vaccines cause autism. I hear this argument often used against anti-vaxxers, "you're endangering my kids, so I have the right to hold you down and inject you with small amounts of toxic substances, for my own good". But fill in the blank with any of the following: be black, Jewish, disagree with me on smoking, have guns, not take vaccines, and so on? That shows the root of the problem: intolerance is intolerance. What if the anti-anti-vaxxers are wrong? And that's the root of the problem, telling others what to do, based on a false understanding of the relative risks, science/medicine. Should we let popular ignorance win out of unpopular science? Y/N. Progressivism/socialism/collectivism murdered >100M people last century? Far more than anti-vaxxers ever did. So relative risks: should we stop tolerating progressive/socialist/communists and force THEM out of communities since historically they've been a greater threat to me and my kids than a measles outbreak in the last century? Or should we learn that other people's opinions have risks to us, but we have to tolerate them, if we expect them to tolerate ours? Where is the threshold of risk before we start legislating their liberty away? 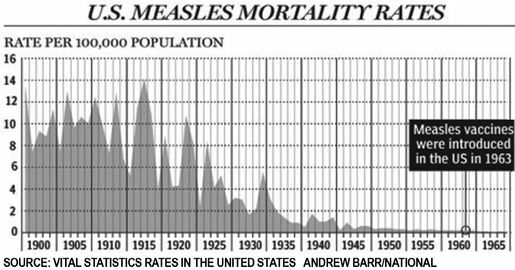 If not getting your state mandated vaccine meets that threshold, then the religion of pro-statism (in the form of communism, socialism or progressivism) is certainly responsible for more deaths last century and thus is the greater risk. So be careful what you wish for, when you decide to start empowering the state to take away our liberties for the greater good (especially based on political ideology, like immunization). People should get vaccinated. People should understand that not being vaccinated isn't that big a threat (especially for most of the things we are talking about). You're more likely to die from bad genetics, poor diet or poor exercise habits... 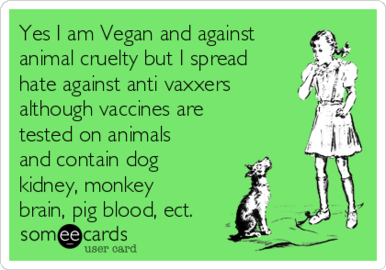 So if you can regulate them based on minor vaccines in a non outbreak situation, then certainly they can force a one size fits all diet, exercise or breeding program on you? Right? If society can show a serious demonstrable threat to others, then fine -- let them do that BEFORE encroaching on my rights. So I have the same standard as free speech -- the speech has to be causing immediate danger to others, before it can be encroached on. At that threshold, I get it. Before it, we should err on the side of individual. Ebola missionaries should be brought into out midst is inane. Just not worth the risk. No matter how careful we think we are. Where there are problem areas is not the rich areas (or those getting personal exemptions). They're the inland/aggriculture communities that have a bigger problem because of illegal aliens/migrant workers, and their kids and visitors (or they visit countries) that have outbreaks. So if you truly care about vaccination rates and outbreaks/herd-immunity, you should be a strong proponent of stopping illegal immigration. Those that don't, are not morally consistent (they don't care about what they think they do, or say they do). Measles is closest (still over the top end of herd immunity in most areas). But if you break it down by area, there are areas where we're either well above, or well below (a good 10%-40% below) -- and it's not the 1-3% of personal/religious belief exemptions (home schoolers, etc) that are the actual problem. It's immigrant pockets. If the left could force vaccinate every one of the personal exemptions (all home schoolers, etc), it would still not get anywhere near getting us over the HIT in areas that have problems. Thus you're not going to fix that by taking away the personal exemption (which is what's getting attacked by the most vocal anti-anti-vaxxers). The real problem is illegals/migrants, according to the numbers -- but if you advocated forcing all immigrants and poor to get vaccinated (to collect any government benefit), the same people cheerleading attacking the person exemption crowd, would scream about civil rights of the minorities and poor. Which is fine, I'm not for forcing either of them -- but the hypocrisy of that position should be pointed out. People that care, seem to dislike the reactions and complication rates of the cocktail vaccinations that caused major problems (like in Japan). Many are not against ALL vaccines, they just have a problem with one, or one cocktail. Bureaucracies don't get nuances -- you're either in full compliance with the state mandates, or you're a rebel. So these discriminatory vaxxers, are labelled the same as the others. Which shows the ignorance of the bigotry of those that lump them with the others. Why do they think this? We know that the reaction rates are lower with the individual immunizations. So why not allow separate vaccinations (like many other countries do), instead of requiring the cocktails? That would seem to be the quickest way to get higher immunization rates on key diseases from the personal exemption crowd. But again, the anti-anti-vaxxers, don't want to give an inch, even when the complaints are valid. When I've pointed some of these facts out, I've had friends that ranted I was an anti-vaxxer (ignoring the points I made to the contrary). To me that reflected more on their biases, bigotries and putting emotions above reading comprehension. 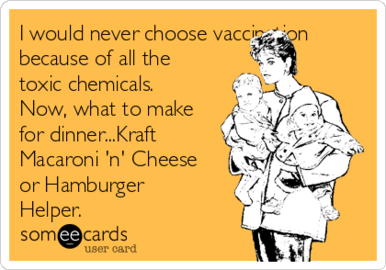 I support vaccinations, and got all mine, and would give them to my kids. I think the benefits outweigh the risks, and the autism link is weak and unproven to me. But there's a LOT more complexity and nuance, and I'm not ready to force my views on everyone else. If there's a hot outbreak of a highly lethal strain of anything, I get that mass vaccination is the best way to protect a society. And I would suspend my individual liberty over group risk in those cases. But that's not what most are talking about. And if they're preaching the benefits a mass vaccinations when diseases aren't running rampant, and putting the state's powers over individuals in that case, with little proven benefits, then it's not about vaccines and public health, but politics and statism. This page was last edited on 2 February 2019, at 12:46.